In these politically correct times, stereotypes regarding an individuals race, gender, and sexual orientation are no longer permissible in open, everyday conversation nor our general media. This trend began in the 1990’s and is now regarded as social Canon. Some argue that it has been taken a bit too far but, regardless, I’m sure most of us can agree that people should be treated respectfully and not have to deal with prejudices regarding who they are – so long as they aren’t committing crimes nor harming others. Despite this new era of “enlightenment” there are still some stereotypes that not only appear to still acceptable but, if the horror industry is any indication, have actually proliferated. Yes, dear reader, I am speaking of the uneducated, backwoods, Caucasian folks most often referred to as (even by the most liberal minded individuals) the “Hillbilly.” Ever since Ned Beatty’s character in DELIVERANCE was instructed to ‘Squeal like a pig,” this demographic has often been portrayed on the Silver Screen as marauding, interbred, deformed, torturous cannibals who sit idly by waiting for passing motorists – not unlike a Venus fly trap does with an insect. According to Hollywood, this lethal demographic usually lives in the forest, mountainous regions (hence the term hillbilly), or really any remote area of the US, far removed from the cosmopolitan/sophisticated individuals who dwell in the city (or any town with running water). When traveling the backwoods, never make a WRONG TURN! The list of movies that capitalize on this theme is endless. 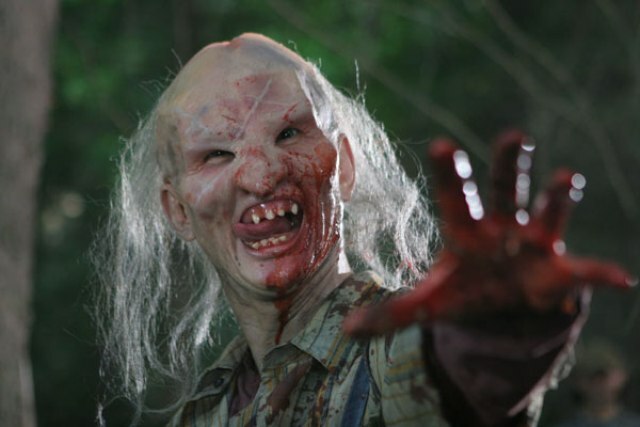 All the WRONG TURNS, HILLS HAVE EYES, and TEXAS CHAINSAW MASSACRES are prime examples. Despite Hollywood’s common practice of overusing what works (or using again something that worked years before via remakes) every once in a great while we get pleasantly surprised. 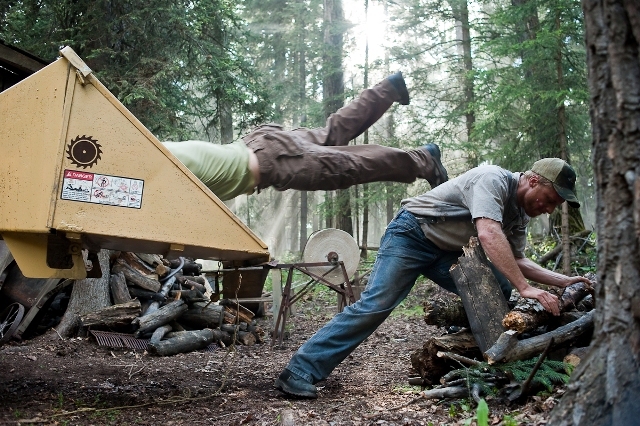 This year’s TUCKER AND DALE VS EVIL is a prime example of these rarest of gems. Not only does this film turn the hillbilly bashing trend completely on its ears, it does so with hilarious results! Both David and I watched this film for the first time together upon my arrival to Rhode Island last month. 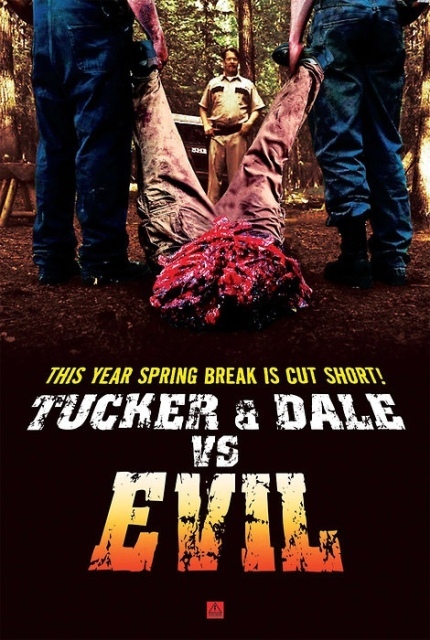 After suffering through an Indie film which I will not name here (for reasons discussed in a recent post) we really needed something to kick up the mood and provide a proper send off to our vacation.TUCKER AND DALE VS EVIL proved just the perfect remedy! Virtually from beginning to end we were laughing out loud and throughout the week talked about how great it was! Tucker and Dale are not killers, in fact they are a likeable pair of guys with Dale a sensitive, gentle sort – nothing like his appearance would suggest. This provides no comfort to the younger set as their misinterpretation of events causes both hysteria along with hysterics (both in the form of bloody deaths) throughout the movie. This is not to say that there isn’t a psycho amongst them and, in some ways, this reminded me of Todd Browning’s FREAKS in which the deformed title characters are the only decent people while the good-looking “normal” folks are the true monsters. TUCKER AND DALE VS EVIL had a short run in select theaters but is WELL worth seeing and adding to your Blu-Ray/DVD collection! The laughs are many and gore-hounds won’t be disappointed either! You will no doubt find these two bumpkins to be an endearing pair right up there with SHAUN OF THE DEAD. This entry was posted in Movie Reviews and tagged FREAKS, HILLS HAVE EYES, Horror Comedy, Texas Chainsaw Massacre, TUCKER AND DALE VS EVIL, WRONG TURN. Bookmark the permalink. ← Scary Monsters’ “Scary Terry” Tells All! Tucker and Dale Vs Evil is the sort of film that you don� t know whether or not you want to see until the movie actually starts.